Geekzine UK founder, Andrew Jamieson, will be reading from and discussing his debut novel, The Vengeance Path, on Wednesday 14th August, at 5pm, alongside fellow debut author, Damien Love, who will be reading from his book, Like Clockwork. Both author’s works are eBooks, and the event is billed as ‘Future Books’ – expect discussion to revolve around the digital medium of publishing but also given the fantastical nature of both books, to get plenty of geeky chat too. Both books were originally published as weekly serials before being published as novels. 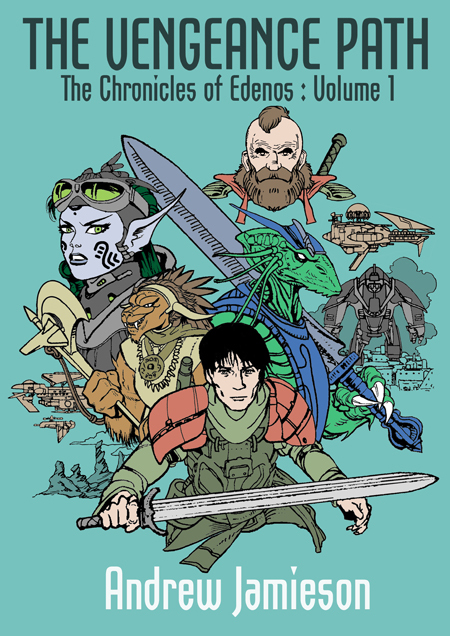 Like Clockwork by Damien Love is an adventure romp across Europe, featuring maniacal robots, whilst The Vengeance Path is the first volume in an ongoing epic fantasy steampunk series, The Chronicles of Edenos. Tickets for the event are £4.50 and are available from the on-site box office in the entrance to the book festival. Like Clockwork and The Vengeance Path are available from the Amzaon Kindle store.